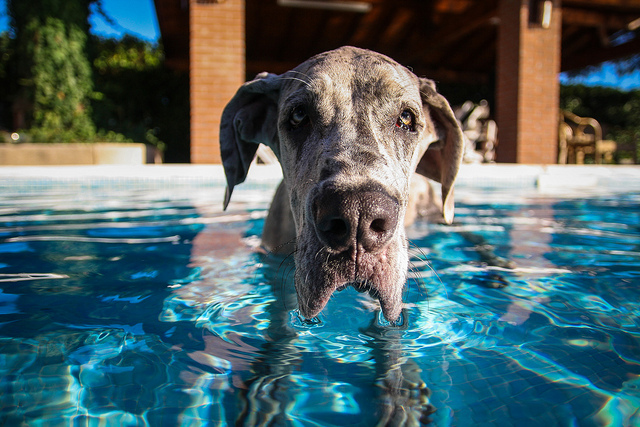 Summer Safety Tips for Dog Owners - Rocky Mountain Great Dane Rescue, Inc.
To your dog, summertime probably means more time to run wild and free in the great outdoors. Whether they’re sprinting through the yard or leaping into the backyard pool, it often seems our dogs celebrate the season as much as we do. But ensuring your pet can safely enjoy the summer means you’ll have to take some extra steps to keep them out of danger. The first step is taking note of the many chemicals that come into play during the summer. We use chemicals on our yards, in our pools, and in our cars and other vehicles, such as lawnmowers, that are absolutely toxic to pets. In order to keep your pet healthy and happy this summer, here are a few summer safety tips. Research before you plant. You may be using these warm summer days to spruce up your yard. If that beautification includes planting any shrubs, flowers, or other plants, make sure they aren’t toxic to your dogs before you put them in the ground. As the ASPCA explains in its top pet poison prevention tips, some plants like oleander and rhododendron could harm your dog’s heart if he or she were to take a bite while other plants can cause kidney and liver damage. Of course, there’s absolutely nothing wrong with having a beautiful yard just be sure before you plant that that beauty doesn’t come at a high price to your dog. Learn more about pool chemicals. By now, the pools in your area are probably overflowing with people seeking some relief from the summer heat. But keep in mind that the chemicals used to clean those pools are very toxic to animals. The more you know about them the better. For an easy-to-understand tutorial on pool chemicals, read through this list of chemicals commonly used in pools and their uses. Consider going chemical-free in your yard. One way to protect your pet from chemicals that are prevalent during the summer, such as insecticides and weed killers, is to avoid using them altogether. Instead, as MotherEarthLiving.com suggests, try going chemical-free in your yard. The article explains the dangers associated with these common yard chemicals and provides tips on how you can maintain your yard without using them. Keep an eye on what your dog is drinking. It’s hot and if you’re dog is running around, it won’t take long for them to get thirsty and start seeking out the closest water source. Often times, that source might be the biggest available to them—a swimming pool. While this article from The Daily Puppy notes that drinking from the pool isn’t necessarily harmful to your dog it’s not the best option either. Follow its recommendation to keep a bowl of fresh water close by when your dog is outside so that he or she can grab a quick and safe drink whenever they need one. We all want our pets to be able to enjoy some fun in the sun this summer. But to do so safely, it’s up to you, their owner, to protect them from the toxic substances that become very prevalent this time of year. Vee Cecil loves sharing her passion for wellness through her recently-launched blog. She is also a wellness coach, personal trainer, and bootcamp instructor and lives in Kentucky with her family.